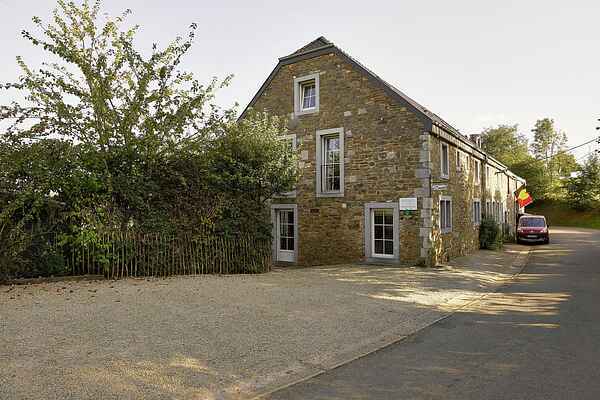 Holiday home Les Lys is a cozy, comfortable holiday residence for 14 people. Les Lys is situated on a hilltop and has a commanding view. You can go play tennis in the area. The home is located 5 kilometers from Theux and 9 kilometers from Spa. Every bedroom has its own bathroom. There is a fenced in garden with a terrace and barbecue and a place to store bikes. You could consult the owner if you want to rent the tenniscourt, 4 km away from the house. Lots to do in the area: There are a ton of hiking and walking options in the area. The ruins of the castle of Franchimont: 6 km. The largest navigable caves of Europe in Remourchamps: 8 km. The town of Spa with the casino and the thermal baths: 9 km. The safari park of Monde Sauvage d'Aywaille: 12 km. The airport of Spa where parachute jumping is possible: 12 km. The dam and the lake of Gileppe: 20 km. The circuit of Francorchamps: 20 km. The waterfalls of Coo and the nature park of Amblève: 21 km. The museum of the circuit of Francorchamps in the abbey of Stavelot with all the cars: 25 km. The smallest town in the world, Durbuy: 35 km. The key of the holiday home is handed over when you pay the deposit.